A WW1 centenary exhibition by British artists Prudence Maltby, Susan Francis and Henny Burnett, and Commonwealth artists Caro Williams (New Zealand), Catherine Farish (Canada) and Sophie Cape (Australia). Cicatrix is a multimedia international touring project, initially funded by Arts Council England. Cicatrix incorporates digital, sound, installation, drawing, print, painting and film. It has toured South West England since 2014, went to New Zealand in 2017, and with funding from ACE and the British Council travels to Montreal in November. The audience is offered insights into the WW1 legacy of Salisbury Plain through the artists’ interpretations of a scarred and ancient landscape. Cicatrix presents the culmination of four years’ work at Swindon Museum & Art Gallery. 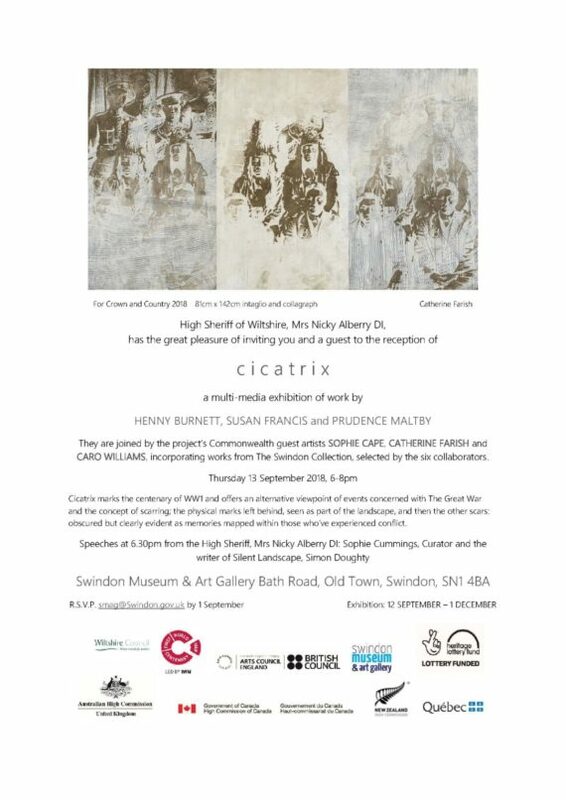 Founder members Henny Burnett, Susan Francis and Prudence Maltby have collaborated with artists from Commonwealth countries which had troops on Salisbury Plain during the First World War.